Both academic and popular representations of globalization, critical or celebratory, have tended to conceptualize it primarily in spatial terms, rather than simultaneously temporal ones. However, time, in both its ideational and material dimensions, has played an important role in mediating and shaping the directions, courses, and outcomes of globalization. 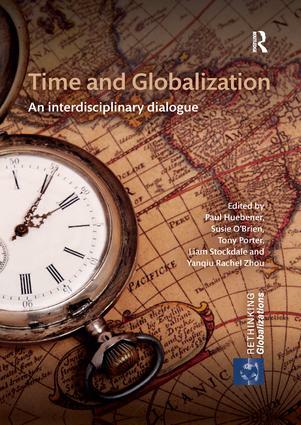 Focusing on the intersection of time and globalization, this book aims to create an interdisciplinary dialogue between the (largely separated) respective literatures on each of these themes. This dialogue will be of both theoretical and empirical significance, since many urgent issues of contemporary human affairs—from large epochal problems such as climate change, to everyday struggles with the dynamics of social acceleration—involve a complex interplay between temporality and globalization. A critical understanding of the relationship between time and globalization will not only facilitate innovative thinking about globalization; it will also foster our imagination of alternatives that may lead to more socially just and sustainable futures. This innovative collection illustrates the theoretical benefits of bridging time with globalization and also exemplifies the methodological strengths of engaging in cutting-edge, interdisciplinary scholarship to better understand the changing economic, social, political, cultural and ecological dynamics in this globalizing world. Paul Huebener is Assistant Professor of English in the Centre for Humanities at Athabasca University, Canada. He is the author of Timing Canada: The shifting politics of time in Canadian literary culture (2015). Susie O’Brien is Associate Professor in the Department of English and Cultural Studies at McMaster University, Canada. Her work has been published in Canadian Literature, Postcolonial Text, Modern Fiction Studies, Cultural Critique, Interventions, Mosaic, South Atlantic Quarterly, The Review of Education, Pedagogy and Cultural Studies. Tony Porter is Professor of Political Science at McMaster University, Canada. His most recent books are Transnational Financial Regulation after the Financial Crisis (2014) and Transnational Financial Associations and the Governance of Global Finance (2013, with Heather McKeen-Edwards). Liam Stockdale is a Postdoctoral Fellow at the Institute for Innovation and Excellence in Teaching and Learning, McMaster University, Canada. He is the author of Taming an Uncertain Future: Temporality, Sovereignty, and the Politics of Anticipatory Governance (2016). Yanqiu Rachel Zhou is Associate Professor at the Institute on Globalization and the Human Condition, McMaster University, Canada. She has widely published in the fields of transnationalism, health, and social policy in edited books and in various peer-reviewed journals, including Journal of Aging Studies, Health, Time and Society, and Social Science and Medicine.